No longer the need to unplug your computer and drive it to a computer repair service or wait for an computer technician to arrive to fix a problem. 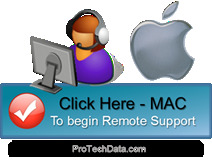 ProTech Data saves you time, hassle, headaches, by fixing your Slow Computer, Virus Removal, performing a Computer Tune Up or PC Technical Support issues online, while you watch. We will make your Slow Running Computer like new! All Technicians are U.S based, and we offer 100% Satisfaction Guarantee. 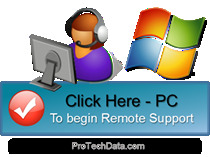 Our Technicians operate your keyboard and mouse remotely to resolve your problems. It's like having the expert sitting at your computer, as you sit back, relax and watch the action! This is completely secure and we only have access to your computer system when you grant us access, and you can see everything we are doing to make your computer run better, faster and resolve problems. So, if your computer is running slow or you need Virus, Spyware or Malware Removal or support for computer problems. Call at 630-430-8090 anytime of the day or night. No Fix? No Risk…Guarantee! You will be charged nothing unless the problems can be resolved.